All the NFL teams are wearing pink! That’s because October is Breast Cancer Awareness Month. Sponsored by the National Breast Cancer Foundation, Inc, this month-long annual campaign aims to raise awareness about the disease. 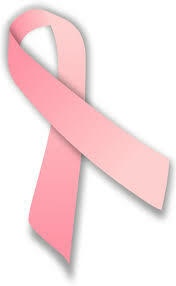 One in eight women will be diagnosed with breast cancer during their lifetime. This no doubt means that someone you know has been or will be affected by the disease. While October may be the designated month for breast cancer awareness, you can get involved any time of the year! Create a plan: The best way to fight breast cancer is for women to have a plan to detect the disease early (when breast cancer is found early, the 5-year survival rate is 98%). The NBCF recommends monthly breast self-exams, annual clinical breast exams and mammograms, and healthy lifestyle habits. They have even created an app that helps you keep track of everything! Encourage the women in your life to create their plan today. Learn more: The NBCF has created an online guide, Beyond the Shock, a resource for women and their families to learn more about the disease. This site includes some inspiring questions, question and answer forums, and explanatory videos, among other resources. Donate: Donate to NBCF or hold a fundraiser to raise money. Proceeds go toward providing mammograms for women in need. Susan G. Komen is another well-known organization that focuses on breast cancer through education, research, and resources. During the month of July, as I’ve been traveling from here to there, I have caught bits and pieces of NPR’s latest series on stress. There have been some really interesting stories, and I’m sharing a few of my favorite highlights below. 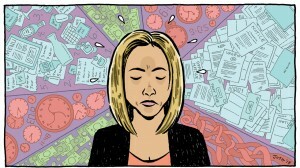 For starters, there’s a piece on the overall picture of stress in America. NPR teamed up with the Robert Wood Johnson Foundation and Harvard School of Public Health to conduct a survey of 2,500 Americans. They found that 49% of respondents had experienced a major life stress within the last year, with the most frequent type of stressor being health-related. When broken down by demographics, there were some interesting findings. For example, young adults were more likely to name “too many responsibilities” as their primary stressor, whereas older adults named health problems. Looking at income, people making below $20,000 named (perhaps unsurprisingly) finances and work problems as their biggest worries. People making over $50,000 named work problems and too many responsibilities. The most common response to stress? Seventy percent of people reported sleeping less than usual. For more on these statistics, click here. For more on the food-mind connection, click here. One of the more upbeat and fun segments was about how Americans deal with stress. Seventy-one percent of respondents said that connecting with friends or family is their go-to form of stress relief. In terms of what works for people, turning to hobbies and time outdoors were reported as being most effective. Click here for the article. Actually, just watching this short video, put together using animations and live interviews of people talking about their favorite stress-relieving activities, sent me into a state of relaxation! Recent news articles in The Christian Post and The Anniston Star (Alabama) mention the Duke Clergy Health Initiative’s findings of increased depression rates among North Carolina Methodist pastors alongside other studies that show similar mental health concerns among clergy. As possible theories for these high rates of clergy depression and burnout, both articles point to the 24/7 nature of the job and pastors’ hesitancy to nurture themselves. It’s hard to buy packaged foods at the store without glancing at the black and white box full of numbers and percentages. But do we really digest the info? The nutrition label as we know it was introduced in the early 1990s, and it really hasn’t been updated since then, despite all the advances that have occurred in nutrition science and recommendations. 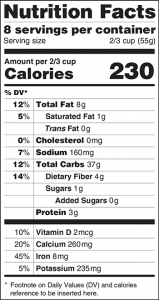 However, a few weeks ago, the FDA released a proposal for a new label in the hope of making the food label more relevant, current, and useful to consumers. The calorie content will be larger and bolder. 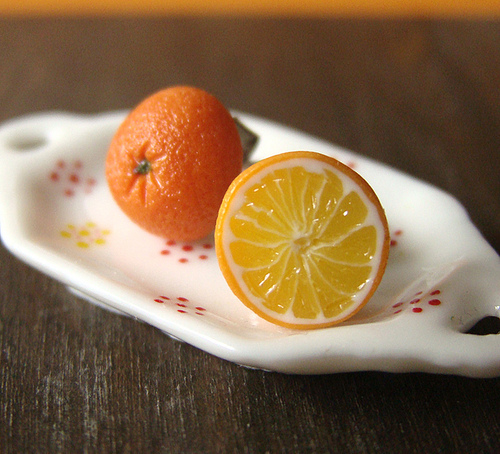 Serving sizes will be more realistic. For example, a 20-ounce bottle of soda will be considered one serving (instead of two) since most people drink that amount in one sitting. The new label will include added sugars. While continuing to require “Total Fat,” “Saturated Fat,” and “Trans Fat” on the label, “Calories from Fat” would be removed because research shows the type of fat is more important than the amount. Certain “Daily Values” for a variety of nutrients would be revised; these include sodium, dietary fiber and Vitamin D.
The FDA will be taking public comments about the proposed changes to the label through the end of May before making a final decision. Food manufacturers will have two years to adjust the new label to accommodate any changes that are officially adopted. Image and information from FDA press release. My interest in the NCAA basketball tournament has nosedived. All of the ACC teams are eliminated — men and women — plus my brackets crashed and burned the first weekend. Thankfully, I have discovered a replacement pastime, which I hereby share with you. Lent Madness was conceived by an Episcopal priest in Massachusetts. Lent Madness allows you to vote online for your favorites out of pairs of great Christian figures from history. The exercise is fun and educational: there are short profiles of each entrant, including many inspiring men and women with whom I was unfamiliar. The competition continues through Easter. Even if, like me, you missed the beginning of the contest, you can still vote in the later rounds. 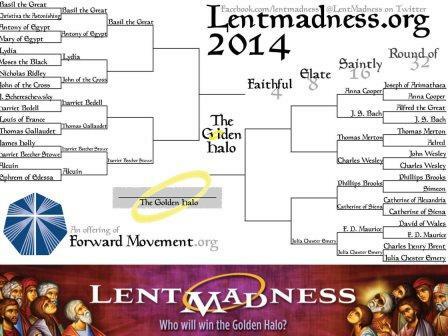 Winners advance to the Saintly 16, the Elate 8, and the Faithful 4, in pursuit of ultimate glory, the Golden Halo. Sadly for United Methodist fans, John Wesley and Charles Wesley faced off against each other in the opening round! (Charles won, in a mild upset.) Talk about your unfortunate seedings. Complaints have been lodged with the Selection Committee. Top image courtesy of Lent Madness. 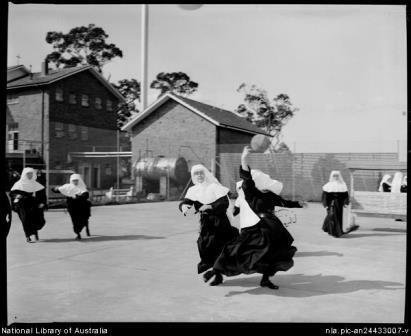 Nuns Playing Basketball is from the National Library of Australia, shared via Flickr. Last week, the Alzheimer’s Association announced new research that indicates Alzheimer’s disease affects more women than men. The reason is two-fold: more women suffer from the disease themselves, and more women serve as caregivers to loved ones with the disease. With more than 5 million Americans already diagnosed with Alzheimer’s and new diagnoses predicted to triple by 2050, it is becoming increasingly important to raise awareness about the disease and to provide support to the families and caregivers of Alzheimer’s patients. Seek support from other caregivers. You are not alone! Click here to find a support group near you. Accept (and request) offers of help; suggest specific things people can do to help you. 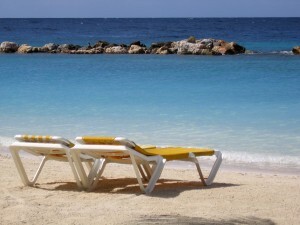 Take respite breaks often — care-giving is hard work! Organize medical information so that it’s up to date and easy to find. Make sure legal and financial documents are in order. 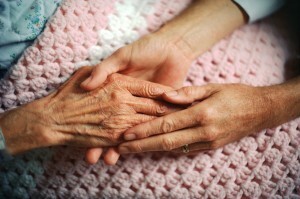 Many more resources for caregivers are available through the Alzheimer’s Association. Below are summaries of 3 recent research studies that have practical implications for taking care of your health. Healthy gums make healthy hearts. Researchers from Columbia University have shown that improving gum health can slow the progression of atherosclerosis, the narrowing of arteries which is associated with heart disease and strokes. It’s been widely accepted that the bacteria responsible for producing periodontal disease also contribute to atherosclerosis; the good news from this study is that improving gum health can actually reverse the progression of heart disease. 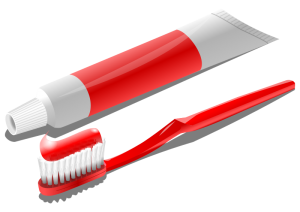 To reduce harmful bacteria in your mouth, it is recommended you brush your teeth at least twice a day and floss daily in addition to making regular visits to a dentist. Read more: Dr. Weil’s Daily Health Tips or Columbia University Mailman School of Public Health. While we’ve heard that high levels of HDL (good cholesterol) can protect against heart disease, new research is showing that how well the HDL functions is even more important. 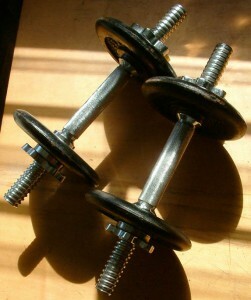 UCLA researchers looked at the effects of weight training on HDL effectiveness, and they found that regular weight training contributed to better-functioning HDL, regardless of participants’ overall weight (overweight participants’ HDL was just as effective as lean participants’). Dr. Andrew Weil, founder of the integrative medicine movement, says, “This suggests that physical fitness may be the best measure of healthy HDL function and, by extension, the risk of heart disease.” Participants in this study engaged in resistance training 4 days a week. Read more: Dr. Weil’s Daily Health Tips or Science Daily. About 30% of adult Americans have prehypertension, a condition where their blood pressure is higher than normal but doesn’t yet require medication management. In a study out of Kent State University, researchers looked at the effect of mindfulness-based stress reduction (MBSR) training on prehypertension. 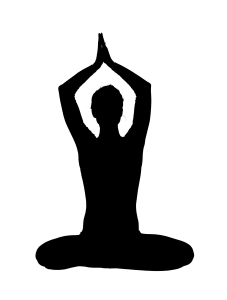 Results showed that participants who participated in an 8-week series of three types of MBSR- yoga, body scan exercises, and sitting meditation– had statistically significant lower blood pressure readings at the end (there was a decrease in both the systolic and diastolic readings). Such an improvement in blood pressure for prehypertension patients could mean delaying or even preventing the need for medications as well as a reduction in risk of heart attacks and strokes. Read more: Dr. Weil’s Daily Health Tips or Medical News Today. -Katie Huffman, inspired by Dr. Weil’s Daily Health Tips blog. First image courtesy of OpenClipArt user Gustavaorezende; second and third images courtesy of wikipedia; all via CreativeCommons. When I found out that Nelson Mandela had died, I felt small and alone and scared. It’s like when I was young and had a problem but my parents weren’t home to solve it. I was old enough to be home by myself – but I still wanted someone wiser and older and better to be there with me. That’s how I feel today. Like all of a sudden we are home alone. But it hit me this evening that we ARE wiser and older and better now. We are the peacemakers, we are the caretakers, we are the decision makers now. We are the grown-ups and this planet is ours.The buck stops with us. Let’s honor Mandela by doing the very, very hard work of refusing to fight others and choosing instead to fight our own egos. Let’s fight for our Earth and for the vulnerable folks – our sisters and brothers – who live on it. Let’s take our places as the leaders of this home. And let’s start in our own families and friendships and neighborhoods. If not us, then who? If not now, when? Thank you, Mr. Nelson Mandela. We will take care of this place you loved so fiercely and tenderly. Until we meet again. 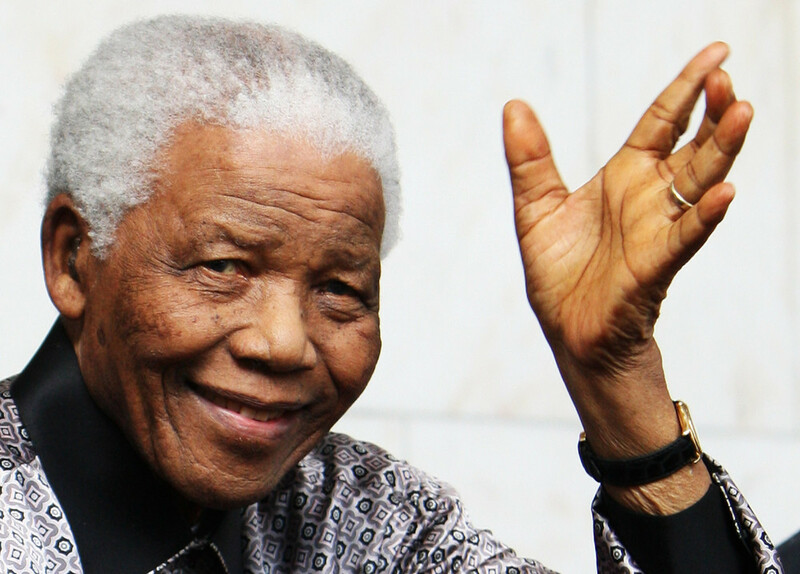 When someone like Nelson Mandela dies, it’s hard to know what to say. I like the words of Ms. Melton reminding us that we all have our own work to do in the spirit of Mandela. There is a lovely tribute to him on the UMC.org page highlighting his many connections to Methodism. May he continue to inspire us all, and may he truly rest in peace. It’s hard to believe it’s been a year since super-storm Sandy hit the northeast. In the face of the amazing devastation that the storm brought to the area, the United Methodist church has been a beacon of hope offering relief services to people who lost so much. Yesterday the bishop of New Jersey issued a letter outlining these relief efforts, and what progress has been made so far. One year ago, Superstorm Sandy rolled into New Jersey and the region and changed lives and the landscape forever. Today tens of thousands of homes are still in need of repair with many people still unable to return to their homes. Repairing: 300-500 homes of low income, elderly and disable people. Providing: case management for 500 families. Recruiting: housing and deploying at least 15,000 volunteers to repair homes. Repairing: churches and parsonages severely damaged by the storm. We are now able to host more than 300 volunteers a week through 12 hosts sites. These host sites provide beds, food and showers. Already more than 5,900 volunteers from 23 states and three countries have logged more than 58,000 hours of relief and repair ministry. Immediately following the storm we fed, clothed and provided day and night shelter to more than 10,000 people. So much good work can be done when people come together to help one another. It is such an encouragement to learn of these efforts, and to know that God’s people are being faithful in myriad ways when faced with such great suffering. 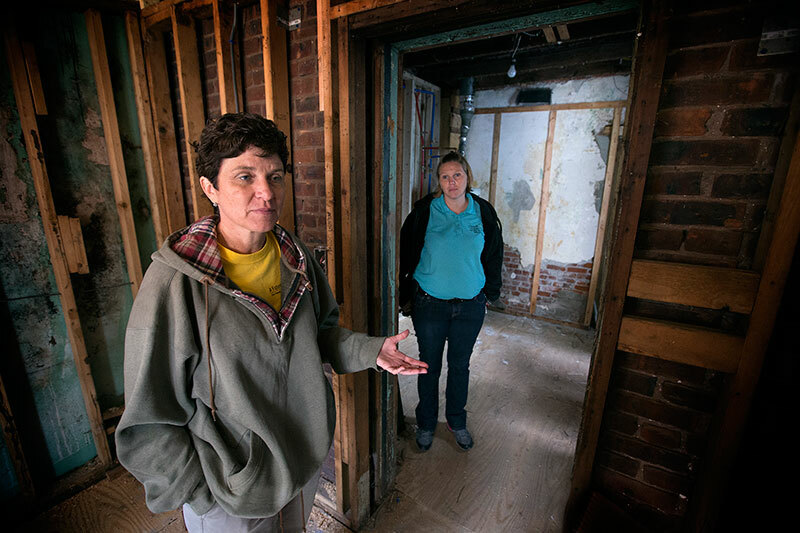 More details of the Sandy recovery efforts, and how Methodists have been and can continue to be involved can be found at the UMC Connections blog. And for those of you whose lives were touched by Sandy, know that our prayers and our efforts continue to be with you. Image by United Methodist News Service, used with permission. A new report questions the age-old wisdom that breakfast is the most important meal of the day, and that it is essential for weight loss. 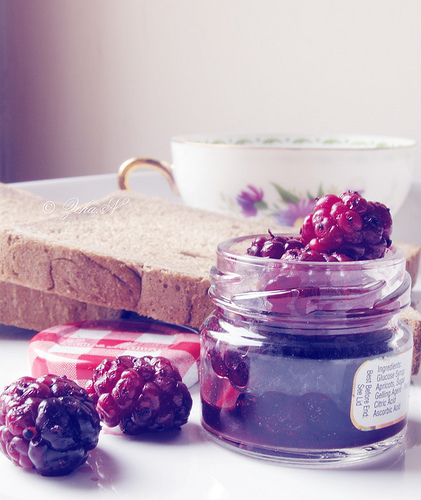 It has long been assumed that folks who eat a healthy breakfast are less hungry throughout the day, thus consuming fewer calories, but it turns out that there is little evidence to substantiate that claim. Furthermore, the breakfast foods that usually ARE consumed (cereals, muffins, bread products) are known to help pack on the pounds. So why the confusion? To eat breakfast or not to eat breakfast? The research showed only that eating breakfast was a common behavior among people who were actively trying to avoid regaining weight, just as diet soda might be a common drink of choice among dieters but not necessarily the cause of their weight loss. None of this will be news to anyone who watched even the first video of the Naturally Slim program (the mindful eating program available to all Spirited Life participants). Marcia Upson, the Nurse Practitioner behind the program, insists that instead of eating breakfast out of habit, we should wait until we’re hungry. If we stay hydrated, drinking our “H2Orange,” then we may not be hungry until 10 or even 11 in the morning. We may then decide to instead eat an early lunch, reducing our number of meals consumed to two a day. By paying attention to their bodies’ true hunger cues, many people have successfully lost weight on her program. All of this is not to imply that you should suddenly STOP eating breakfast. Everyone has different caloric needs, and everyone has different hunger patterns. Perhaps yours kick in first thing in the morning, while your spouse’s don’t kick in until much later. Either way, the best thing to do is listen to your body’s signals, and follow the wisdom that we KNOW is true: eating when we’re not hungry leads to weight gain, and learning to listen to our body’s signals can help us achieve a normal body weight. Maybe it’s time for me to kick my daily bowl of cereal habit! Images by flickr users *Zoha.Nve and Stephanie Kilgast, via Creative Commons. The Connection is the blog of the Clergy Health Initiative at Duke Divinity School. Learn more about our efforts to study and enhance the well-being of clergy.